Some of us have met people when all you have is good intentions on your part that someone is waiting in the wings to swoop in and say something completely opposite or it is not as they portrayed things originally. Jesus was accused many times of many things which a lot of it was false accusations, in fact at times they would try their best to twist whatever He would say. (Luke 11:53,54). And as he said these things unto them, the scribes and the Pharisees began to urge him vehemently, and to provoke him to speak of many things: Laying wait for him, and seeking to catch something out of his mouth, that they might accuse him. When we stand on the word of God in all sincerity there will always be those who no matter what will not be happy with our conversation in Christ, and this does not deter us from the message we carry to those who are searching for the truth that only comes from scripture. (1 Peter 3:15-17). But sanctify the Lord God in your hearts: and be ready always to give an answer to every man that asketh you a reason of the hope that is in you with meekness and fear: Having a good conscience; that, whereas they speak evil of you, as of evildoers, they may be ashamed that falsely accuse your good conversation in Christ. 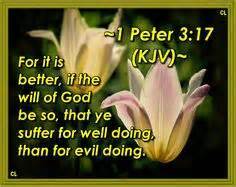 For it is better, if the will of God be so, that ye suffer for well doing, than for evil doing. In revelation we learn that the greatest accuser of the brethren (satan) is cast into the earth will find he will be at a loss of followers, for the people of God will overcome by the faith they hold through the blood of Christ and the word of their testimony. (Revelation 12:9-12). And the great dragon was cast out, that old serpent, called the Devil, and Satan, which deceiveth the whole world: he was cast out into the earth, and his angels were cast out with him. And I heard a loud voice saying in heaven, Now is come salvation, and strength, and the kingdom of our God, and the power of his Christ: for the accuser of our brethren is cast down, which accused them before our God day and night. And they overcame him by the blood of the Lamb, and by the word of their testimony; and they loved not their lives unto the death. Therefore rejoice, ye heavens, and ye that dwell in them. Woe to the inhabiters of the earth and of the sea! for the devil is come down unto you, having great wrath, because he knoweth that he hath but a short time.